What is an IEC Connector (PAL Connector)? This connector is pretty rare in the US, but you might still see it. Its correct name is a “Belling-Lee connector,” but of course no one calls it that. In countries where it’s in common use, it’s referred to as a PAL connector, an IEC connector, or just an aerial connector. Here in the US you probably call it “that funny plug on the back of my audio receiver.” Let’s look a little deeper into it. The IEC Connector is generally attached to antenna cables. In most cases, it has a male connector on one side and a female on the other, making it easy to extend cables without the use of a barrel connector like we use here in the US. This means that you can extend an antenna signal more easily and with less loss. 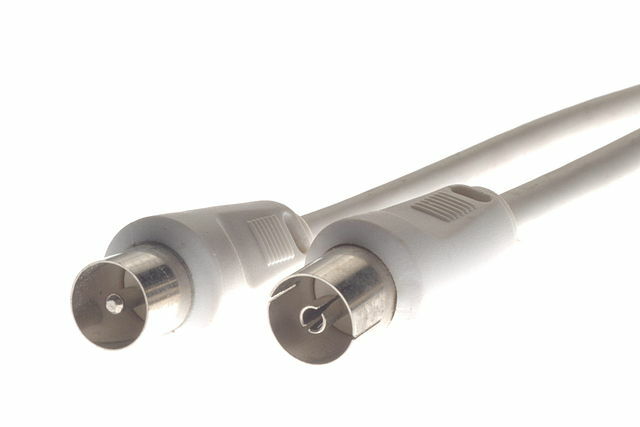 The IEC connector works well for over-the-air antenna frequencies but does not do as well for satellite frequencies. The F-connector, with its thicker outer connection, screw threads, and direct connection between the center conductor and the opposite connector, is a much better choice for the higher frequencies needed by satellite TV cables. Sources say that the connector was first devised by a company called “Belling and Lee, LTD” in or around 1922, when Great Britain first started radio broadcasts. It features a robust center plug with a push-on fitting that fully shields the plug inside from outside radiation, which makes it ideal for over-the-air applications of many kinds. The connector was later standardized by the International Electrotechnical Commission, a Swiss consortium that was standardizing just about everything in Europe just like the US’s own IEEE was doing here. They saddled it with the ungainly name, “IEC 61169-2 radio-frequency coaxial connector of type 9,52.” This being the only IEC-standard connector many people used, the term “IEC Connector” became common usage. I’m an American, why do I care? and that’s an IEC female connection. 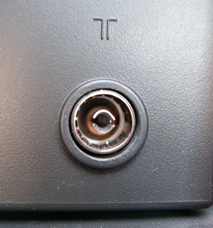 There are several theories to why companies like Yamaha and Denon would use this connector instead of a female “F” connector like pretty much everything else. Some folks think it’s because these companies just don’t make TVs or other consumer electronics and therefore somehow don’t know that Americans use the F connector while other countries don’t. I think that’s poppycock because there are so many other customizations needed for the US market and even if it’s true they would have fixed that decades ago. No, I think the more likely explanation is that the IEC connector can sink into the inside of the box, reducing the overall depth (or allowing the receiver itself to be deeper and still fit in a rack. A female F connector would require precious space at the back of the receiver and then you have to realize that almost all F connections are straight runs from fairly thick cable. All told you could lose 1-2 inches of precious depth there. I admit even that is a thin explanation but I have to admit I don’t understand how devices come to the US with IEC connectors. There are adapters, of course, that will adapt an IEC connector to a more-standard F connector and if you can all keep a secret… we at Solid Signal are working to bring them in at a great price so it’s something you can have whenever you need one. NICE AND EASY: Are indoor antennas affected by weather? Should you buy a variable gain amplifier? What’s the best option for recording antenna TV?